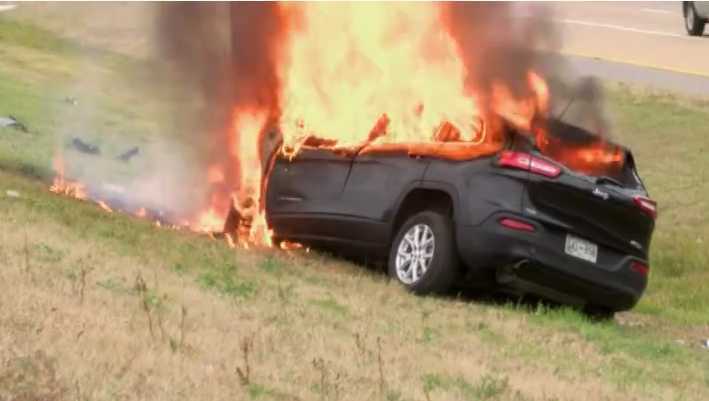 MEMPHIS, Tenn. — Witnesses were left amazed after a Tennessee man who was rescued by good Samaritans on Sunday just before his vehicle exploded also discovered that his Bible remained unharmed although his SUV was completely destroyed. According to reports, the man’s Jeep Laredo was sideswiped by another car on Route 385 near Memphis, which caused him to veer off the road and down a hill, and then smash into a pole. Witnesses state that the jeep immediately burst into flames upon striking the pole. When none could find a fire extinguisher, first responders used a jack iron to try to break through. The man appeared to be pinned in the vehicle, now a fiery inferno. “It appeared he was completely trapped in the driver’s seat because the steering wheel was pressed up against his chest,” driver Corey Kilpatrick told local television station WKRC-TV. Good Samaritans helped cut the man’s seat belt and pull him from the vehicle. Moments later, it exploded. “None of the flames touched him,” Irby explained, thanking God. The man, who has not been identified, was transported to Regional Medical Center with non-critical injuries. Investigators were further amazed as they found a Bible lying in the passenger’s seat amidst the remains of the charred vehicle. The Bible was untouched by the flames although the car was completely destroyed. “This is truly the most incredible thing I’ve seen today. Driver saved from burning car, everything burned but Bible,” reporter Lynnanne Nguyen posted to social media, along with photographs as proof.